19th century green and silver antique velvet ribbon decorative bolster pillow 19th century green and silver decorative bolster pillow with antique ribbon. Decorative bolster pillow embellished with an antique woven and embroidery velvet French ribbon which is framed with antique metallic threads silver trim. The trims are framed with green silk velvet on both sides. Decorative bolster pillow finished with the ATG custom flat trim in a small checkered pattern all around the throw pillow with the same textile in the backing. 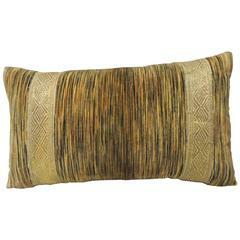 Decorative bolster pillow in shades of green, gold, silver and brown. Decorative bolster pillow hand-crafted and designed in the USA. Throw bolster pillow with custom made pillow insert and closure by stitch (no zipper.) Size: 15 x 20 x 6. This fine large Navajo Indian weaving bolster pillow is in great condition and has a brown cotton linen backing. The insert is down and feather fill. This fine Navajo Indian weaving large bolster pillow. The backing is in a soft Italian kid glove leather. Great condition.